Purple foods, particularly purple fruits and vegetables, are sought after by health-conscious consumers and those in the know, as the vibrant colour indicates a naturally high presence of health-enhancing anti­oxidants. 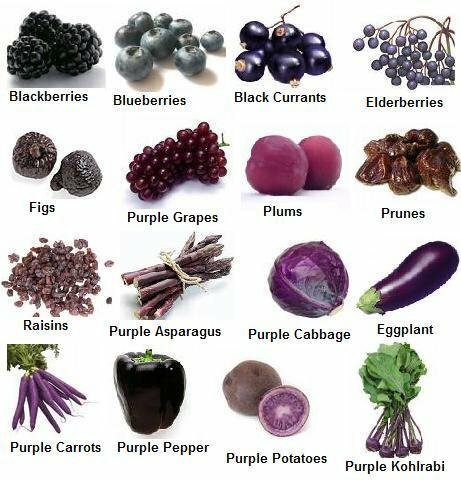 From purple potatoes and carrots, to trusty red cabbage and blueberries, this list of purple fruits and vegetables boasts plenty of nutritional credentials behind the vibrant hues, they are not only a great way of adding colour to a dish, they should help you feel good about eating them too. Roasted, juiced, spiralised, souped or blended into vegan smoothies, beetroot is a nutritional powerhouse packed with vitamins, minerals and antioxidants. And if that wasn't enough, it's even low in fat. Beetroot is also great for haute cuisine. Check out this stunning seafood recipe from chef Antimo Merone, at 8 1/2 Otto e Mezzo Bombana restaurant, for a lobster salad with beetroot puree. Blueberries have long been recognised as a superfood of the fruit world, catapulting them into the spotlight for those health conscious consumers. High in antioxidants this purple fruit is delicous eaten in its natural state, or baked into desserts. Find our recipes for mouth-watering blueberry desserts here. Eggplants are a versatile purple vegetable that can be eaten any number of ways - full of vitamins, minerals and dietary fibre, they are also said to have the potential to lower cholesterol and help manage weight. Plenty of reasons to put eggplant on the plate. Try our 5 easy eggplant dishes – perfect for a weekday dinner. Figs are rich in natural health benefiting phyto-nutrients, anti-oxidants and vitamins. Dried figs are a great concentrated source of minerals and vitamins. Find out more in the A-Z of figs – they were one of Cleopatra's favourite fruits. Purple potatoes are reported to contain four times as many antioxidants as Russet potatoes thanks to anthocyanin, the pigment that creates the purple colour in the potatoes' skin and flesh. Turn those purple potatoes into tasty chips with this recipe for beet and potato chips with rock salt and rosemary. Red cabbage is another awesome purple vegetable packed with antioxidants, nutrients, vitamins and minerals, as well as dietary fibre. Discover 6 ways of cooking with red cabbage today. Tired of white cauliflower? Try purple cauliflower rich in vitamin C, with a half cup of florets reportedly providing nearly half of the daily requirement for vitamin C.
Purple cauliflower also packs a nutritional punch when it comes to fibre, vitamin A, folate, calcium and potassium and selenium. All good news when it comes to staying healthy. This asparagus is so sweet it can be eaten raw, meaning you get to enjoy all those health enhancing antioxidants to their full potential. The rich colour of blackberries is a giveaway that they have some of the highest antioxidant levels of all fruits. Rich in bioflavonoids and Vitamin C, they are low on sodium and calories. Enjoy them naturally to benefit from their nutritional goodness. Believe it or not, a few hundred years ago, all cultivated carrots were purple; the orange carrot wasn't cultivated until the late 16th century. It's unsurprising to see purple carrots sprouting up again given their stunning colour coupled with their anti-inflammatory properties and antioxidants. The açaí berry, a naturally blueish-purple fruit, is packed with antioxidants as well as being rich in fibre, protein, carbohydrates, vitamins A, B, C and E, mineral salts (calcium, iron, phosphorus and potassium).. and the list keeps going. Find out more fascinating facts about acai, from A-Z here. Eye-catching purple corn contains a variety of phytonutrients (plant nutrients) including massive amounts of phenolics and anthocyanins, suggesting they are high in anti-oxidants ... essentially helping us to stay healthy. Try this recipe for purple corn tortillas. This purple yam is a staple of Filippino cuisine where it is used in both savoury and sweet dishes. Ube is rich in fiber and contains virtually no fat - it's a great purple vegetable to add to your daily rotation. This honorary member of the purple fruit or vegetable family, lavender is used in a variety of recipes and is prized for its health benefits. This fragrant herb aids in relaxation and stress relief. Try these 5 ways of cooking with lavender. Did you know grapes are botanically classified as berries? Red grapes, sometimes called purple grapes, are rich in heart-healthy resveratrol, a compound known for its antioxidant and anti-inflammatory properties. Try this delicous potato salad with goat cheese, red onions and grapes. This purple-skinned fruit reveals a bright yellow interior with sweet and sour seeds packed with flavor and antioxidants. When it comes to purple foods plums should always be on your list. This humble fruit comes in different varieties but the most popular one in the United States is the purple plum (also called black plum) with yellow flesh. Plums are rich in fiber and help ease digestion, as well as being a wonderful source of vitamin A. Find fresh plum recipes here.